YOU GUYS, IT’S HERE!!!!! 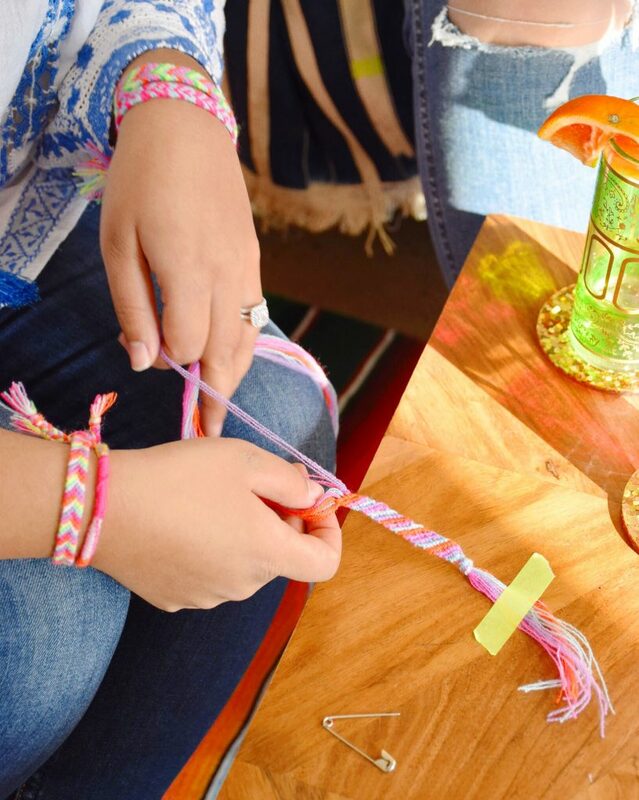 Our Friendship Bracelet DIY Kit (our second kit ever!) 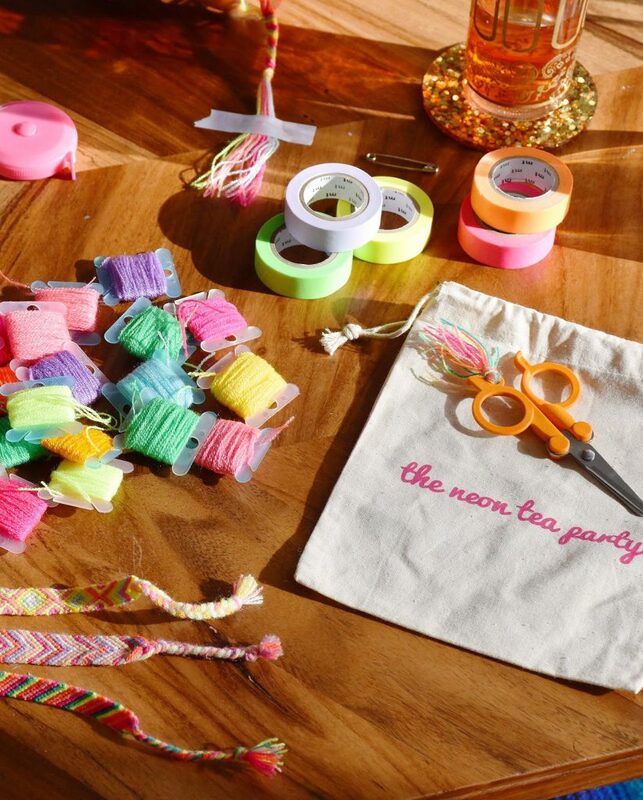 is finally available at The Neon Tea Party and we are obsessed with it to say the least! 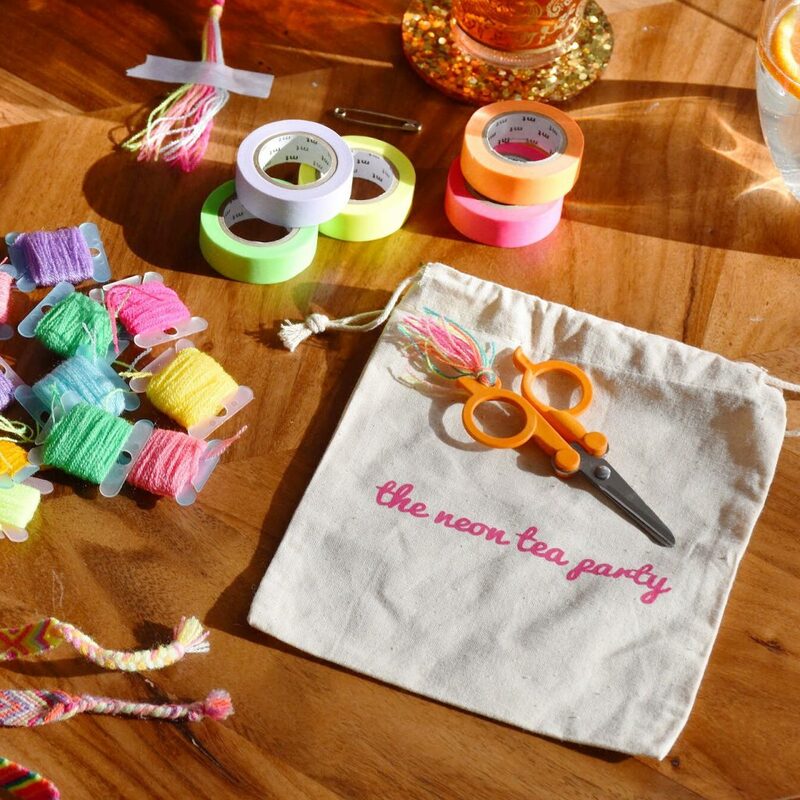 Just like our Pom Pom & Tassel DIY Kits, we wanted to include our most favorite tried-and-true supplies to ensure your friendship bracelets turn out beautifully and that you have a delightfully stylish crafting experience while making them. Each element of the kit is my all-time favorite supply in its category and I am so freaking excited to share this curated, travel-friendly kit with you! 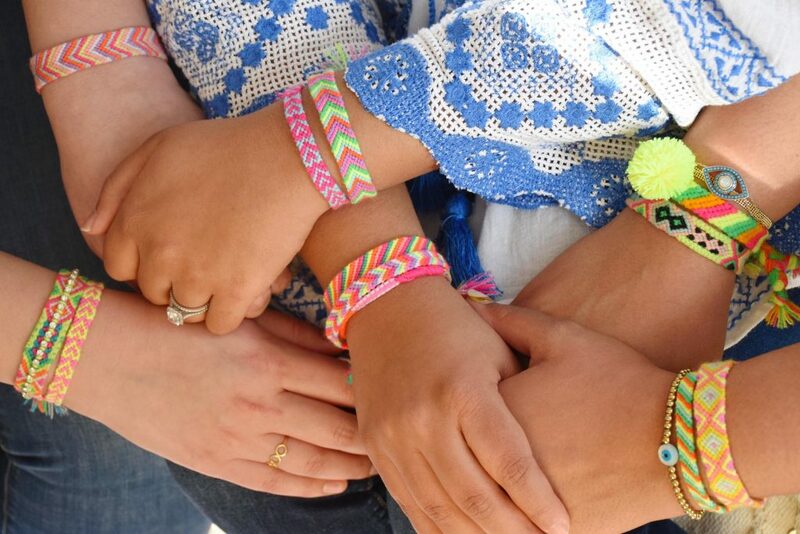 You can use the kit in tandem with our Friendship Bracelet DIY instruction page, plus stay tuned for more fun friendship bracelet project ideas coming to the TNTP blog! Let’s dive into the kit, shall we?? 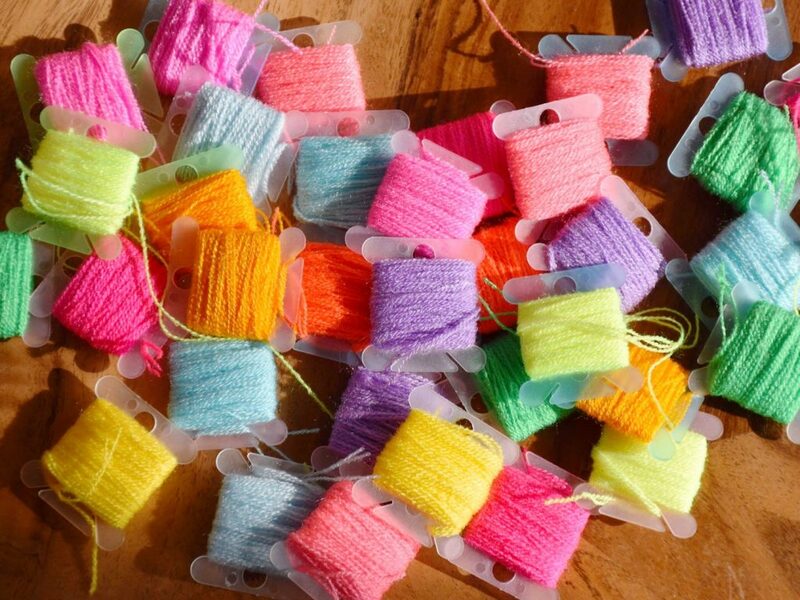 Did you know that our favorite pom pom and tassel yarn is also our favorite string for making friendship bracelets? Omegacryl is a vibrant acrylic fiber whose weight is somewhere between a yarn and a thread, making it ideal for small fiber crafts like friendship bracelets. The colors pop brighter than your usual embroidery floss and provide a straight-from-the-mercado look. Plus when the ends are knotted, the fringe looks like little tassels, which is always a plus in our eyes! The kit includes Omegacryl in seven colors (128″ each): Strong Pink, Neon Yellow, Mandarin, Water Blue, Parrot Green, Lilac and Coral. Additional yarn is available here. There are so many reasons these little Fiskars® scissors were an obvious choice for this kit. They fold up for easy travel (no accidentally tearing a hole in your craft bag!) and are TSA compliant, making your friendship bracelet kit the perfect travel activity for any plane, train or automobile. 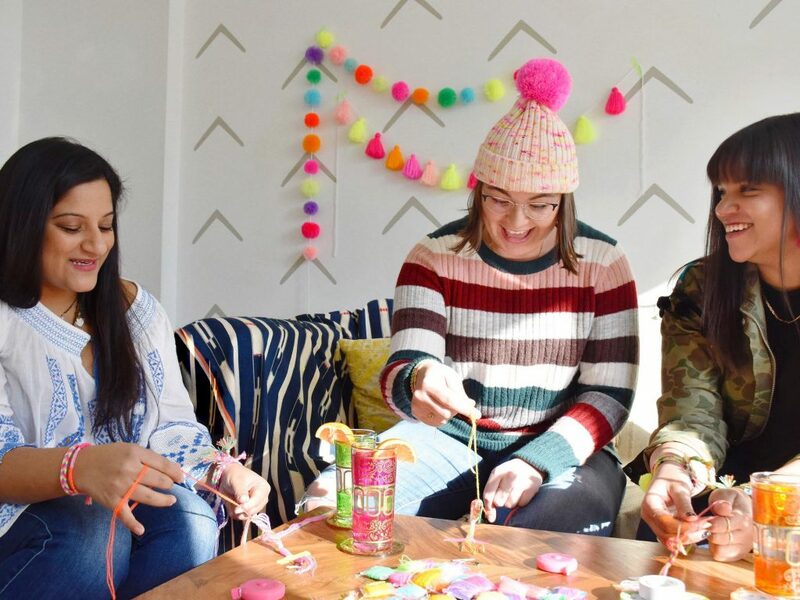 It’s no secret we love accessorizing, and the little loop on these scissors enables you to turn your scissors into a crafting necklace, or simply jazz them up with some colorful yarn. Fiskars® is the best scissors brand around — and we’re all about hooking you up with the best! 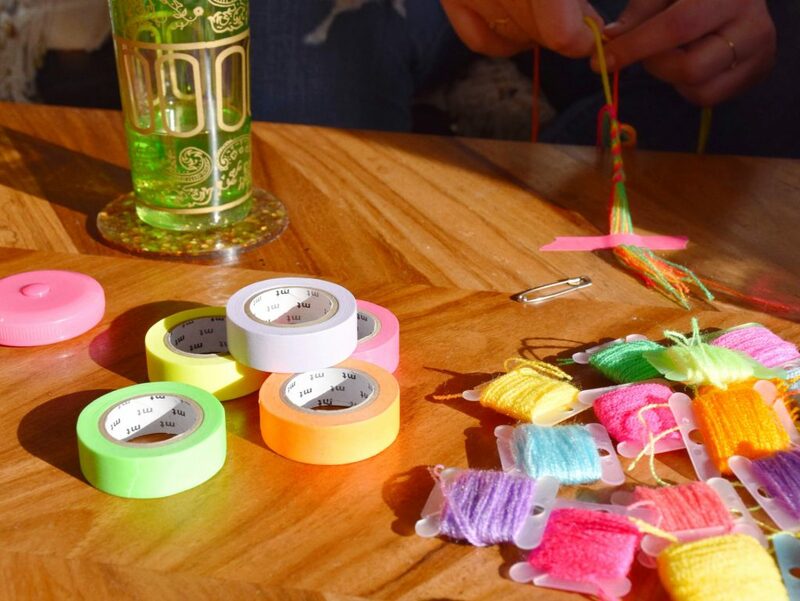 Just like the scissors, we wanted to include the OG, best-of-the-best washi tape for taping your bracelet yarn in place for secure knotting. MT masking tape is made in Japan–the home of washi tape–by an almost 100 year-old masking tape manufacturer and is one of the most beloved washi tape brands around. This washi tape is as strong as they come but leaves zero residue when removed. Our favorite thing about mt masking tape? The COLORS, of course! The neons and pastels are the most vibrant we’ve seen, and we are so excited to offer eight different colors in the shop. 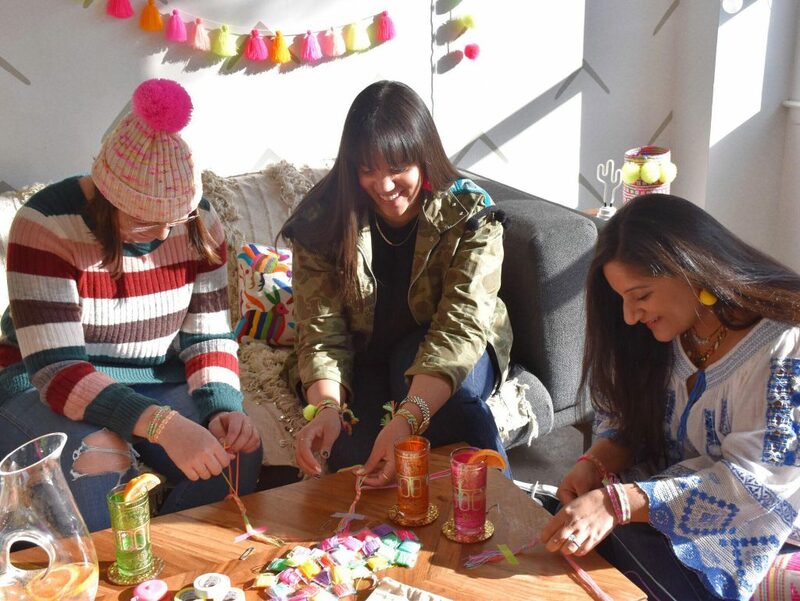 The washi tape color included in your friendship bracelet kit is totally up to you! And finally, an instruction card explaining how to make Candy Stripe and Chevron patterned bracelets + how to finish your bracelets to perfection. You can find instructions online here, as well! That’s our newest kit, you guys! You can shop it for just $20 or order individual elements as needed in the shop. I’d love to know what you think of our newest products so please leave any questions / comments below or email me directly at marisa@theneonteaparty.com.